A supplement to today's early post: Tom saw a White Stork flying over Rainham Marshes, and got a distant but unmistakable shot. A most unusual sighting in the London area. Yay! 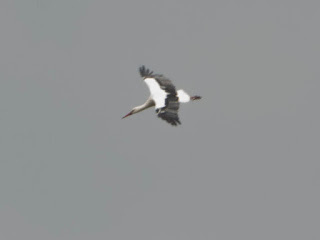 A stork on the wing is always the loveliest sight. I saw one myself in London many years ago, high over the Thames. A once-in-a-lifetime sighting here. Great surprise for him. Remember leading a trip at Dungeness some years back when one flew over the visitor centre there- excitement for all. Seen a couple more in England but never in the London area.